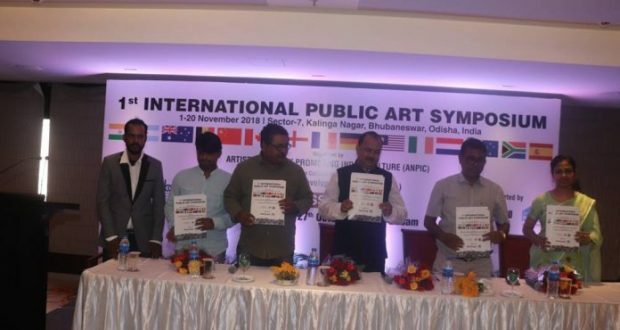 Bhubaneswar:27/10/18: Bhubaneswar will host India’s 1st International Public Art Symposium (IPAS) from 1st November to 20th November under the auspices of Artists Network Promoting Indian Culture (ANPIC) and Bhubaneswar Development Authority (BDA). Noted artists from 14 countries will be attending and creating sculptures from Waste materials, which will be permanently displayed at a Sculpture Museum provided by BDA for the people of Odisha. The sculpture artists from Australia, France, Germany, Italy, South Africa, Malaysia, Sweden, China, England, Canada, Belgium, New Zealand, Spain, Ireland will participate in the mega event, according to a release issued by BDA. The live sculpturing will continue for 20 days and after that an open air sculpture museum will be inaugurated. Themed on ‘Reduce, Reuse, Recycle’, the museum would serve as the only open air Public Art Waste Material Sculpture Museum in the Smart city which would create awareness amongst people of Odisha on environment, Climate Change and Reuse of Waste Materials etc. “This programme has two major objectives — one is to aware people about the waste materials with the campaign ‘Reduce, Reuse & Recycle’. And the other is one should think about the aesthetics of this initiative,“ he added.